The Fisker Karma has had a strong bond with Hollywood since it was first introduced last year. Not only can Fisker tout numerous celebrity owners like Leonardo DiCaprio, Justin Bieber and Cee Lo Green, the automaker can now say that is has been featured in a major motion picture as a symbol of the American Dream. The Karma luxury hybrid appears in the upcoming corporate thriller Paranoia, which is due out on next October. The movie, which stars Harrison Ford, Liam Hemsworth, Amber Heard and Gary Oldman, centers around a boss that blackmails one his employees to spy on a rival company. According to Ford, the Karma plug-in hybrid represents a major part of how his character Jock Goddard is able to seduce the young upstart Adam Cassidy (Hemsworth). No stranger to press attention, the Fisker Karma has made countless headlines lately due multiple recalls and fires. In August, Fisker Automotive recalled 2,400 Karmas after determining that a cooling fan defect was responsible for a parking lot fire. The vehicle in question burst into flames while its owner was shopping in a grocery store. Aside from the recent recall, Fisker garnered additional bad press last month due to a negative review written by Consumer Reports. Aside from simply receiving a failing grade, the Karma earned Consumer Reports’ dubious honor as the lowest-ranking luxury sedan available on the market. 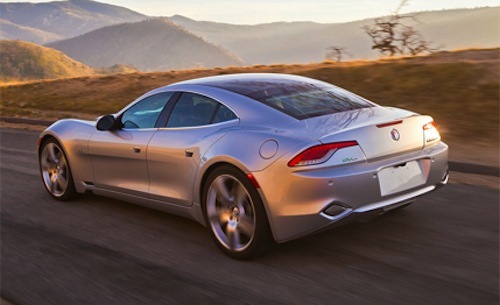 A Fisker Karma purchased by Consumer Reports infamously broke down in March 2012 after driving less than 200 miles of test-driving. It was the first time a test vehicle had ever broken down on Consumer Reports track. Introduced in 2011, the Fisker Karma is a plug-in hybrid luxury sports car manufactured in Finland. The EPA has rated the Karma’s fuel economy at 52 MPGe in electric mode and 20 MPG in gasoline mode. The vehicle’s all-electric range is 32 miles. The EV touts a base price of $102,000 and $116,000 for the top model.